BAM! focuses on engaging each student’s curiosity by delivering content in a non-traditional, fun, and entertaining manner. While working and learning about their robot the campers will take a series of five classes. We hope to show our campers how these seemingly difficult and abstract subjects can be brought to life through a centrally-themed project, hands on activities, and real world problem solving scenarios. Read more about the courses below, then REGISTER HERE! THE PROJECT: Build an Otto Robot! DIY with a small screwdriver and 3-D printable with TinkerCAD, this robot can be easily programmed to walk, turn, avoid obstacles, dance, and make sounds! Read more about your potential robot and view fun project galleries on its website. This crash course will teach you about the fundamentals of sequential programing using a computer language called Scratch. It’s one of the most popular introductory programming languages to teach kids and is generally used as a stepping-stone to true computer coding. It has a very simple drag and drop interface that will allow you to immediately put your newly learned skills to the test. Your first challenge will be to BRING YOUR ROBOT TO LIFE! You will learn the full capabilities of your robot as you program it to walk forward or backward, turn around, dance, avoid obstacles, and make sounds. Do you enjoy creative writing? Crafting poetry? Constructing arguments for persuasive writing? If you love putting pen to paper, then this is a class for you! You will have the opportunity to learn about and try your hand at a variety of writing genres from the creative to the practical. Come ready to roll up your sleeves, sharpen your pencils, and write away! 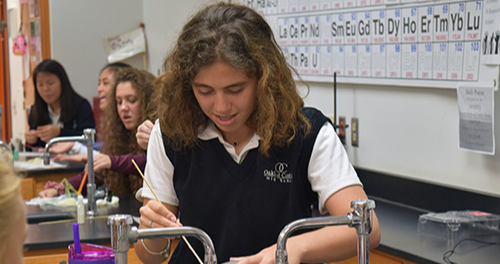 During this class students will be exposed to a multitude of different scientific disciplines they will encounter in high school. The course will focus on engaging students in Biology, Chemistry, and Physics through real life investigations, demonstrations, and hands on activities. Don’t be alarmed if something explodes, catches fire, or truly amazes you! That is to be expected and we will break down all of the science behind it. Can you think of a way to make your robot better? Is it just missing that one little thing? Could a trendy accessory put your Otto over the top? Well then let's learn how to use TinkerCAD software and the 3-D printers to actually make it! TinkerCAD is a 3-D modeling program that allows the user to create custom projects fully ready to print. What will you do to make your Otto stand out compared to the rest?